Thompson Pump & Manufacturing Co., Port Orange, FL, is now celebrating its 40th year of providing pumps and pumping solutions. “I am proud to celebrate this landmark achievement as it is a record of accomplishment that represents our resilience in an ever-changing industry,” said Bill Thompson, Thompson Pump president. A record registration of 200 attendees marked the American Pipeline Contractors Association’s 39th Annual Convention at the El San Juan Hotel & Casino in San Juan, PR. This was on top of a record attendance at the 2009 meeting in Scottsdale. A near-record crowd of 350 attended the Power & Communication Contractors Association annual convention at the Contemporary Resort, on the grounds of Walt Disney World in Orlando, FL, March 20 – 23. That number included 20 new members and 40 first-time attendees. In 2009, Michels Pipeline Construction, a division of Brownsville, WI-based Michels Corp., was involved in construction of portions of three major North American pipeline projects: TransCanada’s 2,148-mile Keystone Pipeline, Kinder Morgan’s 1,679-mile Rockies Express Pipeline and Enbridge Energy’s 1,000-mile Alberta Clipper Pipeline. Despite all it has to offer as a nature park, a large portion of Powell Butte in Portland, OR, slopes toward Meadowland Mobile Home Park (MMHP), a community of approximately 200 residents. Since it was developed in 1988, MMHP has historically experienced flooding and saturated ground conditions each winter during severe storm events. The relatively impermeable soils and high local groundwater conditions exacerbate the problem. LMK Technologies has introduced to the North American market a new robotic camera/cutter system for rehabilitating sanitary sewer laterals. The German-made Schwalm robotic systems, widely used in Europe and Asia, are available now from LMK Technologies, said Larry Kiest, chief executive officer and president of LMK. With typical daily temperatures barely topping 5 degrees Fahrenheit, winters in Calgary, Alberta, can easily hinder trenchless operations. Liquids in machinery can freeze solid, while expanding groundwater can potentially warp rails and other equipment in launch pits. Workers placed the last piece of the Aurora Prairie Waters Project supply pipe on Thursday, February 11, 2010, nearly two years after pipeline construction began. The Prairie Waters Project will help drought-harden the city of Aurora, CO, beginning in 2011. 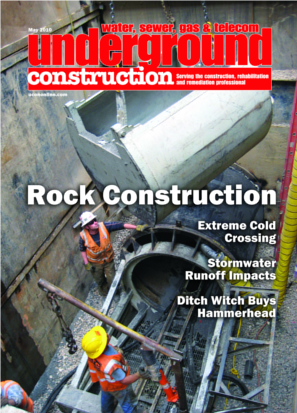 In a transaction that surprised most of the underground construction industry, the Earth Tool Co. and its HammerHead product line was acquired by The Charles Machine Works Inc., manufacturer of Ditch Witch equipment. Farwest Corrosion Control Company has patented a cathodic protection controller for steel water tank applications. The PowerMag 1000 is an innovative, environmentally friendly, cathodic protection controller designed to automatically provide a constant, IR free potential to internal water tank surfaces. The Houston City Council, bowing to the inevitable, recently voted to phase in sewer and water rate increases over three years by as much as 30 percent. That means an average single-family household will see their typical rate climb from $47 to $60 per month by 2013. The rugged T555RW Rockwheel has a 185 hp John Deere Tier 3 engine and modular rockwheel attachment for accurate, reliable cutting. The new Trencor T1760 mechanical drive chain trencher offers plenty of power and performance in the toughest digging conditions. The 220-hp HT220 is the heavy-duty track trencher you need when tackling big underground utility installations on tough terrain, such as wind-farm construction and installation of pipelines and energy-distribution facilities in remote locations. Major updates have been made the 2000 Trencher Series necessitating that all model numbers have been changed, and in some instances, new ones added. The 14/14 rock trencher is an extremely versatile 14 tonne machine. The new Rivard RIV-523 TR250 Rock-Saw Trencher is ideal for wind farms, fiber networks, and oil and gas pipelines up to 8 inches in diameter. Recognizing that the operating skill of workers using small loaders on typical jobsites ranges from the novice to the expert, Caterpillar has developed a new control feature that allows each operator to run a Cat C-Series Skid-Steer, Multi-Terrain or Compact-Track Loader safely, productively and comfortably. The new Wired DataLogger offers contractors, supervisors and pipeliners the ability to record and document the pipe fusion process. The SPY handheld PTR (pig tracker receiver) combines digital technology with a user-friendly interface for easy and reliable operation. Made for use on low powered electric chop saws with up to 4 hp, the new 14-inch PS-FORTE chop saw wheel from PFERD is fully reinforced, making it ideal for cutting sections and solid materials such as rebar and tubing. The new Ultimate tire line is designed to provide extra long life with up to twice the tread depth of conventional skid-steer tires. New Holland announced its solution to meet the Tier 4 interim emissions standards, which will be effective in 2011. The Air N Arc 300 ALL-IN-ONE Power System offers 4 cfm rotary screw compressor combined with a 7kW generator, 300 amps welder and battery booster in one compact footprint. Hyundai Construction Equipment is expanding its Total Coverage Warranty to now cover all 9 Series Machines for three years or 3,000 hours on the entire machine and structurally for five years or 10,000 hours standard. The Pipe Handler easily attaches to an excavator to pick up and maneuver PE pipe on site. Gehl compact articulated loader models 140, 340 and 540 feature tipping loads ranging from 1,900 to more than 5,100 pounds (when not articulated) and rated operating capacities from 950 to more than 2,550 pounds. Manhole and pipe coating systems from Raven Lining Systems, Sprayroq, AP/M Permaform, Sauereisen, Warren Environmental, SpectraShield Liner Systems and Standard Cement Materials. It looks like Congress will give cities and counties some new flexibility in funding drinking water and sewer projects. The Small Business and Infrastructure Jobs Tax Act of 2010 (H.R. 4849) that passed in the House, 246 - 178 on March 24, has a provision which allows states to issue private activity bonds for water projects without counting the value of those bonds toward state caps. Increases in public-sector construction spending, driven by stimulus funds, helped boost total construction activity by almost $2 billion between February and March, according to a new analysis of federal spending figures released May 3 by the Associated General Contractors of America. The figures show that the stimulus has gone from slowing declines in construction spending to contributing to increases, the association noted. Joseph W. Barsoom, P.E., PLS, senior principal engineer, Parsons Brinckerhoff, will be honored as the recipient of the American Society of Civil Engineers’ (ASCE) 2010 Stephen D. Bechtel Pipeline Engineering Award. The award recognizes Barsoom’s contributions to the advancement of pipeline engineering. A study funded by the Plastics Pipe Institute Inc. (PPI) that evaluated the successful use of corrugated, high-density polyethylene (HDPE) pipe for use under heavy rail car loads with shallow cover, is now available on-line: www.plasticpipe.org/drainage/cppa_technical.html.